[2011-04-21] Hobie Fleet 4 had some very specifc requirements for this NOR. It had to have the Coronado Bridge, promote the Hobie Cat Company factory tour, and advertise San Diego as a destination. We tied the colors of the bridge and Hobie's latest sail pattern ("Seabreeze") together to create an eye-catching poster that's still RRS compliant. A subset of graphics were developed for the event Facebook page and t-shirts. [2010-12-02] The organizing committee chose a 50's / 60's mild retro theme for this event poster / NOR. The simple colors and geometric shapes made this a fairly quick draw. The poster is fully compliant with the Racing Rules of Sailing Appendix J requirements for a Notice of Race. [2010-11-28] Held on the Mississippi Gulf Coast, this event promises to be a showcase for Southern Hospitality. In that vein, a play on the Southern Comfort liquor label was used as the basis for the NOR. Despite its origins, it's still a RRS Appendix J compliant NOR. [2011-03-27] The event was held in conjunction with the City of Ft. Lauderdale's 100 Anniversary Celebration, and the NOR theme was coordinated with the city's use of hand-tinted posters from the 1940s. Hobie Cats were Photoshopped on to a Ft. Lauderdale postcard from that time period. The upper graphic image was used in Facebook page graphics, t-shirts and banners promoting the event. The event was a great success, drawing 60+ boats from all over the US, Canada and Puerto Rico. [2010-07-08] The design evokes the "desert kitsch" of the venue's proximilty to Las Vegas. The "road sign" logo was adapted to t-shirts and other collateral material. The NOR is fully RRS Appendix J compliant. W1DM also set up and managed the Facebook and Twitter accounts promoting the event. [2010-07-07] The local Soling fleet wanted something to represent the fleet and the competitors' nationalities. Plus, it had to be easy and inexpensive to print on hull stickers. This three-color collage fit the design directive perfectly. [2010-07-07] Lake McConaughy was created by Public Works Authority as part of Franklin Roosevelt's New Deal. The poster evokes the themes of the era with a classic Art Deco font and patriotic colors. A simplified version was used as the event logo on apparel and collateral material. W1DM set up and managed the Facebook account for the event. [2010-06-09] The iconic skyline of Toronto serves as a backdrop for F18s tacking downwind. A simplified, three-color version was used for the event t-shirts. [2010-05-14] Held on Lake Arrowhead, California, this venue is in the midst of a National Forest. The poster is derived from a 1930s National Park Service poster. The tagline (The Adventures of Today are the Memories of Tomorrow) is from the original poster. [2010-01-14] Since this was the fortieth anniversary of the event, the organizing committee wanted to do something special. A "40s" poster theme was developed from a photo of a 16 start at a large regatta. Fully RRS Appendix J compliant, the design was adapted to t-shirts and other collateral material for the event. [2009-12-30] The A-Cats need a little more verbiage in their NORs, limiting the design options a bit. 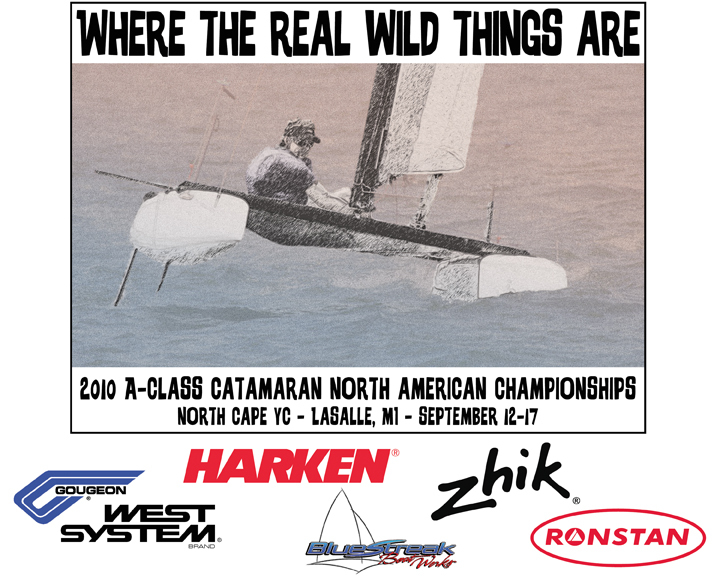 Here, we used a photo of an A-Cat start with a full-color background to create a classy NOR, suitable for a full page ad in a magazine or newsletter.For the event shirts, a completely different theme was used. This once-in-a-lifetime event was held off the beach in Dana Point, California - the original home of the Hobie Cat. W1DM created the event artwork and NOR, which was subsequently used to brand the entire regatta - t-shirts, posters, banners and a video about the event. This event was awarded the US SAILING One-Design Regatta of the Year award in 2008.